The template downloaded before this update date comes with header with no IMAGE support. Thanks to Whisper for the information on that. 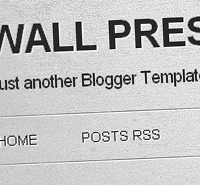 I’ve updated the template downloads with HEADER IMAGE support. For those who downloaded and using the template, you have to change a small piece of code with another. Go to Design > Edit HTML > Click on “Expand Widget Templates”. Search for the following code using CTRL + F.
Just above that code, you’ll see these codes. simple, clean but elegant bro..
Hello, I want to try this template but I want to add an image instead in the title of this template, it can do it, doesn't it? @Whisper, I've updated the post with the solution..thanks for informing me about that..
Hi Berg, try this direct link. Hello and thanx alot for the beautiful theme! I have a small Problem. I want to add Adsence blocks avter each post, but it appear only after the last (more before the second last post) posting. Is something wrong with the theme code? Google Adsense allows only up to three ad blocks per page. You are displaying two ad blocks in the sidebar. So, only one ad left which will be shown within the post. Look, if you was on my blogsite, can you please tell, as an professional, what would you like to change in design and may be with placement of google adds? Yeah sure! I like the image behind the header. And the design is quite good. For the ads placement, I would like to suggest you to place only one ad in sidebar. Do not place ads within posts in Blog Home Page. Place google ads above and below the post in Post page like what I did in this site. I would try to move adds from Homepage to Post-Pages, but i can’t find any options to do that. Can you halp me one more time please? Hi, I’ve previously posted about adding Adsense ads to blogger post pages only.